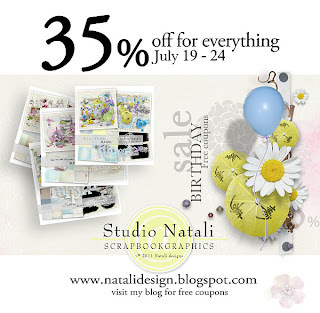 Come to celebrate my birthday and enjoy 35% wholestore off sale. Všechno nejlepší Vendulko!! A hodně zdravíčka! Happy Birthday! I wish you happiness and inspiration. Maybe the next theme can be something with sun, sea and sand?? The weather is awfully bad here in Holland so a little sunshine would be nice!!! I will be soooooooo happy to see your new kit about the romanticist, the first appointments and about wedding. I hope your special day is wonderful. Maybe a kit about summer cooking, picnic's, barbecuing. Happy Birthday and have a wonderful week. Všechno nejlepší k narozeninám:-) ať ti jde práce stále tak dobře jako teď. Happy Birthday (though I'm one day late :))!!! Wish you joy, inspiration and success in everything you do! I keep thinking about the theme of your next kit - what about something magic? Fairy-tales, beautiful princesses, elves and sprites? Happy Birthday! I would like to see a bathroomkit. With bath tower, foam, bubbles and a lot of other things which we can find in the bathroom. Happy Birthday hun, hope you have a great time. As for your next kit, maybe something about going back to/starting school? My kids go back (and my youngest starts) next month so I'll have photos of them in their uniforms to scrap! A traveling or tour kit would be fun. Happy Birthday, Vendula! Wish you all the best! I would love to see a school kit. Happy Happy Birthday Vendula! Hope you're having a wonderful Birthday Month :) I think you'd do an amazing white kit - wedding/graduation/baptism, that type of white and sweet and delicate! Thank you so much for all your generosity! Happy birthday! Maybe a suggestion: a kit about poems (poetry) or about a painter (van Gogh or Monet for example)? Happy Birthday! I think you would make a fabulous "By the Lake" theme set. :) Have a wonderful day. Happy Birthday Vendula. I hope you had a fantastic day. Hope you will have some great celebrations of your birthday! I wish you a special b-day with your family! Have a lot of fun celebrating it! Happy Birthday Vendula! Maybe the next kit will be Sea related, fresh and fishy? Or a Bird of Paradise with jeweled colibri colours? You are so good with birds. Talking of birds, Blue bird of happiness? That would be great. Všechno nejlepší Vendulko! Ať se Ti práce daří jako doposud! A další kit by mohl být nějaký cestovatelský? Happy birthday. For a them...how about something beachy. Hope you have a wonderful birthday Vendula, thanks for the sale! I absolutely adore your kits and I'd love to see a kit from you to scrap the rare relaxation moments ... reading, music, walking, sitting in the sun, even just sitting with a hot drink. As theme for a next kit perhaps "Love you to the moon and back". New theme? Maybe about summer nights, stars, moon, firefly, etc.